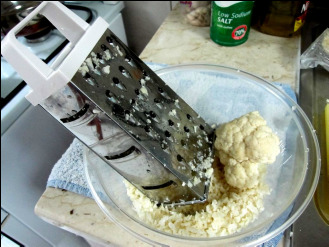 Grating cauliflower by hand is quite easy and quick unless you want industrial quantities. Place the grated (riced) cauliflower in a lightly oiled pan for five minutes to remove some of the water and develop the nutty taste which suits so well. Salt and pepper to taste are all the spices you need and you can also mix with lightly sautéed chopped onions to form a great risotto-style alternative. It's not going to deceive anyone into thinking it's basmati, but it tastes great and also augments curries well. Why not try the delicious salad Tabbouleh recipe? Just steam in a covered bowl in the microwave for 3-4 minutes. That's it! 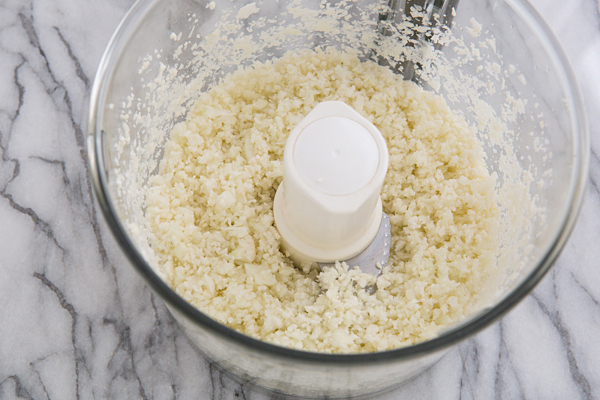 It works well when you make it in the food processor too as long as you don't overdo it by grating for too long.... you'll end up with a powder. You'll probably have too much, so fill some freezer bags for future use! ... or to use the food processor if you have one?